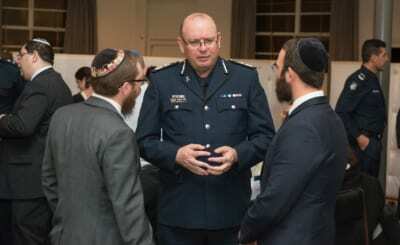 Victorian Police Chief Commissioner Graham Ashton joined members of the Jewish community, and faith communities across the state, by hosting a Victoria Police and Jewish community dinner. About 200 people attended the event at the St Kilda Synagogue on Wednesday night. The dinner aimed to further strengthen relationships between police and faith communities and included a panel discussion featuring students from Mount Scopus Memorial College and Leibler Yavneh College. The panel discussion explored the perspectives of young people on their connection to faith and how social media can be a positive and powerful tool to educate and influence young people and promote social cohesion. CCP Ashton said the panel provided valuable insights into how young people see the world and their ideas for the future. “We know that faith is an integral part of a young person’s identity and it’s important that we hear their perspectives. “For police, it’s also a critical way to keep in touch with the community and make sure we’re a modern and relevant organisation,” he said. CCP Ashton said it’s important for Victoria Police to maintain its long history working in partnership with faith communities and to recognise the contribution they make to a diverse community. “When we commit to learning about different religions, cultures and traditions, we foster the conditions for respect and understanding to flourish.